The Hong Kong Arts Festival (The Festival) and The Hong Kong Jockey Club Charities Trust (The Trust) actively try to enrich the cultural life of the city by providing platforms for international and local artists in all genres of the performing arts to showcase their talents. Aiming to explore and promote inclusiveness and understanding via the arts, the Festival and the Trust will co-present “No Limits”, a new project to be launched in 2019. Every person has limitations. The arts, with their infinite possibilities, can help us find strength to break down barriers and create a world with no limits. “No Limits” strives to create an inclusive space for people with different abilities to share the joy of arts together. 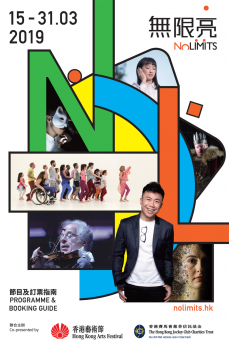 In 2019, “No Limits” comprises a seven-programme series of dance, theatre, music performances and other art forms by local and international artists . The project also invests heavily in arts education for young people, where diverse arts experiences are designed to nurture students’ interest in the arts, and to promote understanding of inclusiveness to every corner of the community.